The news of his death quickly reached Patricia Frederick, who was in the late stages of producing an unprecedented seven concerts in the Collection’s spring series in Ashburnham. She reached out to familiar Frederick Collection figure Stephen Porter. Not only was Porter able to recast his schedule for the date, he also offered to commemorate Smith’s Grieg theme with four of the 68 Lyriska stykker. He had already presented quite a few of these Lyric Pieces in the Fredericks’ series, so this was doubly appropriate in Porter’s tenth appearance in Ashburnham. 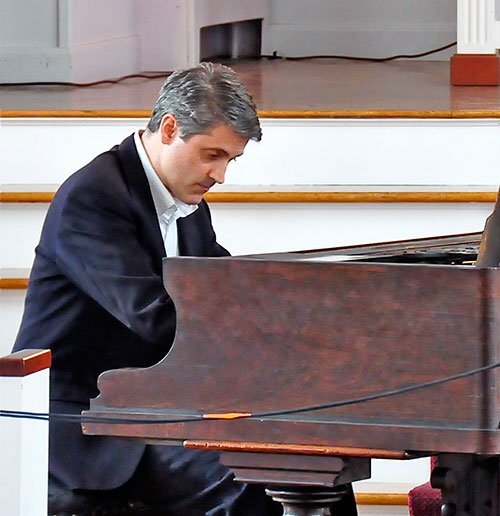 The warmth outside wafted over the sound of rather too many Harley-Davidsons and slight spring scents into the Ashburnham Community Church, now in its 30th season as venue for these concerts. Porter strode briskly out to the 1877 Blüthner grand and swung straight into a finely nuanced, rhythmically straightforward reading of two Lyric Pieces, the winsome, celebrated Op. 47, No. 3 Melodie (Allegretto) and a less well-known example, the Op. 57, No 1 Svundne dager (Vanished days; Andantino). The latter quickly exhibits all the Grieg hallmarks, hewing comfortably to Romantic formulas of the time. It struck me that our New England Romantics, notably Arthur Foote, Arthur Whiting, and deft Ethelbert Nevin, undoubtedly knew these scores (1880s-90s) intimately, and that these Norwegian exemplars were not without a certain influence on how Boston (and New York, and Pittsburg) piano music came to sound. The substantial audience clearly engaged in what Porter had to say. Both originally published books of Debussy’s Images (1904; 1907) came next. The big Blüthner’s astonishingly broad palette of colors and its timbral expressivity, as well as its ability to put across this composer’s carefully specified dynamic layering, were little short of a revelation, even to those familiar with instruments by this revered Leipzig maker. Debussy purchased one (1904) for his studio. I sensed that, in the hands of an experienced Debussian like Porter, rather a lot of what the composer intended 110 years ago came through. This was simply spellbinding. I won’t dim the memory of it by attempting to characterize what is, after all, best experienced live. After the pause, Porter got under way with a further pair of the Lyric Pieces. Op. 12, No. 2 Vals (Allegro moderato) demonstrated, enjoyably indeed, that the slight extent and 3/4 time of small Grieg works are hardly sugary confection; they call on minimal keyboard range, use telegraphic small gesture, and toss a ferociously challenging conceptual gauntlet to the player. In this case, with lovely results. Op. 43, No. 6 Til foråret (To spring; Allegro appassionato) offers a more obvious set of backward-peering vignettes. They present little pianistic challenge, but they do, as was the case here, benefit from quiet, subtle insight into flow, opportunities for color and interrelated contrast, and belief in the compelling appeal of compact means. Claude Debussy owned the remainder of the announced program, but so did the ever-beguiling soundscapes offered by this exceptional piano. The Fredericks’ 1877 Blüthner is German-made but is still audibly akin to the Viennese school of piano building from which Blüthner and their competitor firms (Tröndlin, Bechstein, Schiedmayer, Grotrian) derived. Three deeply evocative Préludes each from the 1er Livre (1904) and the 2ème Livre (1907) brought us sounds that, alas, we have simply lost touch with on today’s pianistic stage. I cite especially Bk. 1, No 10 La cathédrale engloutie, and Bk. 2, No. 7 La terrasse des audiences du clair de lune (The roof terrace where moonlight holds court) [My translation after Paul Jacob’s insightful liner notes for his 1970s recording, with which some of you will presumably take issue, tant pis.] Mr. Porter let us have infinite Debussian shadings and pulled off that tough feat of establishing planes of seemingly free motion atop a profound, bedrock pulse. The closer, familiar from earlier recitals by this pianist, was L’Isle joyeuse (1904; Quasi una cadenza), five-and-three-quarters minutes of summoning, swirling timbre, densely embedded short motifs, rhythmic propulsion, and ice-clear, very quick sweeps through the top three octaves. With the Blüthner, whose top two and some octaves sustain forever (the whole instrument does, to be be true, even without the patented Aliquot) and which broadcast brilliant clarity and strikingly coherent harmonic content, the overtly orchestral nature of this alternative direction in piano design come across well. I must say that the homogenized roar and annoyingly same-colored sound of the piano soundscape of choice today simply don’t communicate this much emotion, nor does it permit even fine players to elicit the radiant, or evanescent, or vanishing ppp of the profoundly expressive instruments—whether German, French, or American of Debussy’s era. Ending his afternoon in simplicity, Porter gave us an unaffected Grieg gem, the familiar Op. 68, No. 5 Bådnlåt (At cradleside; Allegretto tranquillamente). How touching to return to the fine shade of the late Joseph Smith with resonant, liquid chords and the forever sustain of a memorable concert grand.